Grevillea crithmifolia has two forms. One is a compact two metre tall shrub. The other is a dense ground cover with a spread of at least two metres. The latter form is the one most favoured by gardeners. Light green leaves are divided at the end into three narrow segments. In spring plants become covered with dense clusters of white or pink flowers. Honeyeaters are attracted to the flowers. Prune lightly after flowering to maintain dense foliage. A well-grown, ground covering form of G. crithmifolia will form a dense, weed-suppressing carpet. 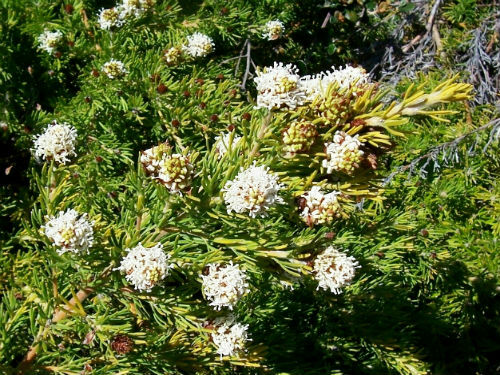 G. crithmifolia is found in the southwest of Western Australia. The species name refers the similarity of the leaves to those of the genus Crithmum, Rock Samphire. Propagate from cuttings which may be slow to produce roots.